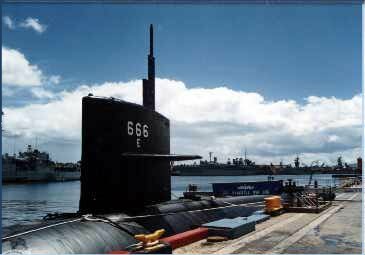 The purpose of this Web page is to list alumni of the Hawkbill SSN-666 in order that they may contact others with whom they served. Sometimes called "The Devil Boat" prompted by a quote from Revelations Chapter 13: "And I stood upon the sand of the sea, and saw a beast rise up out of the sea . . . Here is wisdom. Let him that hath understanding count the number of the beast: for it is the number of a man; and his number is 666." USS Hawkbill was built by Mare Island Naval Shipyard and launched on April 12, 1969. She is a Sturgeon (637) Class Fast Attack Submarine. Length is 292 feet; beam is 32 feet, displacement is 4060 tons; crew is 120 men. The last of the Sturgeons, she officially was decommissioned 3/15/2000 and was scrapped soon thereafter. The sail was shipped to the Idaho Science Center in Arco, Idaho to be part of a museum. The Original Hawkbill and the start of a grand tradition . . .
USS Hawkbill SS-366 during fleet activities out of Fremantle, AU under Commander F. W. Scanland between August 1944 and August 1945 sank enemy vessels totalling 40,900 tons, knocked out radio stations and ferried commandos on search and destroy missions. The Balao Class 366 was ultimately loaned to the Netherlands and served under the name "Zeeleeuw" S-803. On Nov 24, 1970 it was sold to that country for scrap. Access USS Hawkbill SS-366 Page. ------- Read the "Captain's Memorial". Another Hawkbill Reunion is happening ! May 12th-14th 2019 in Las Vegas (Fremont Street) in Las Vegas (Fremont Street). Please email: JPRIII - PRutter@GMail.com for further details. The Deck Log is password protected. User Name is case sensitive so capitalize the first letter. The Password is the word "crew" in lower case. If you served under Commander Perry, use the XO's name instead. When using this material. please credit source.